We were starving when we reached this place. En route, I was teasing 14K, saying let’s go to an Indian restaurant, or let’s eat here, or there. I know 14K hates spontaneity and was determined to eat pasta.You can see it in the way he marched, so full of… determination. The decor was homey, with cheesy–get it? Italians use lots of cheese–murals depicting the country life of Italy, framed by bricks. The lighting was yellowish, romantic, but not good for photos. See the drapes on the ceiling? I wondered how often they wash it. There were only 2-3 other tables occupied on a weekday night. Good for dates. 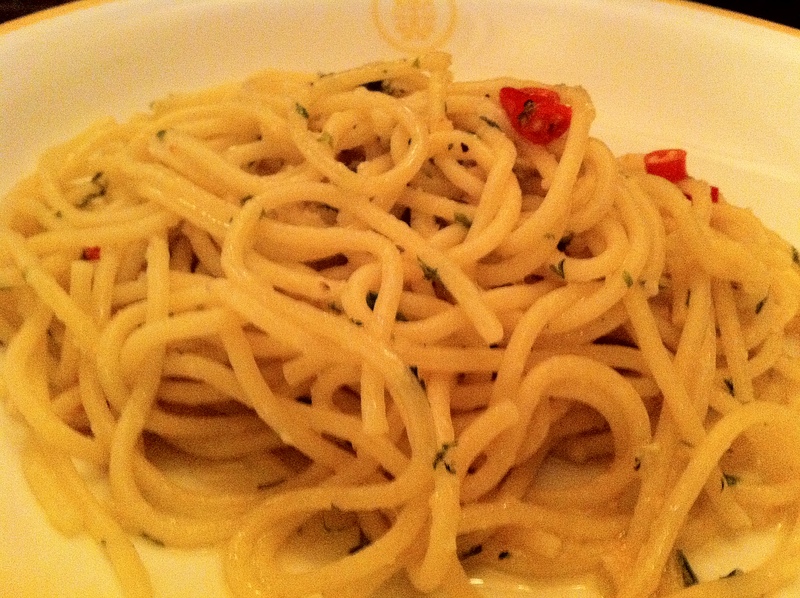 We ordered Aglio Peperoncino ($16.40) and Mare E Monti ($18.90). The pasta is done al dente, so it’s firm. I prefer my pasta to be soft like noodles – I ah Beng what! Always jiak at kopotiam, bak chor mee, etc. Aglio Peperoncino is basically garlic, olive oil and chili flakes. I didn’t think it was worth $16.40. It was a little too spicy for me, but 14K relished it. Good for vegetarians. Mare E Monti is a marvelous dish. “Mare” means “ocean” and “monti” means “mountain” so in this dish, there are crab meat from the ocean and mushrooms from the mountains. 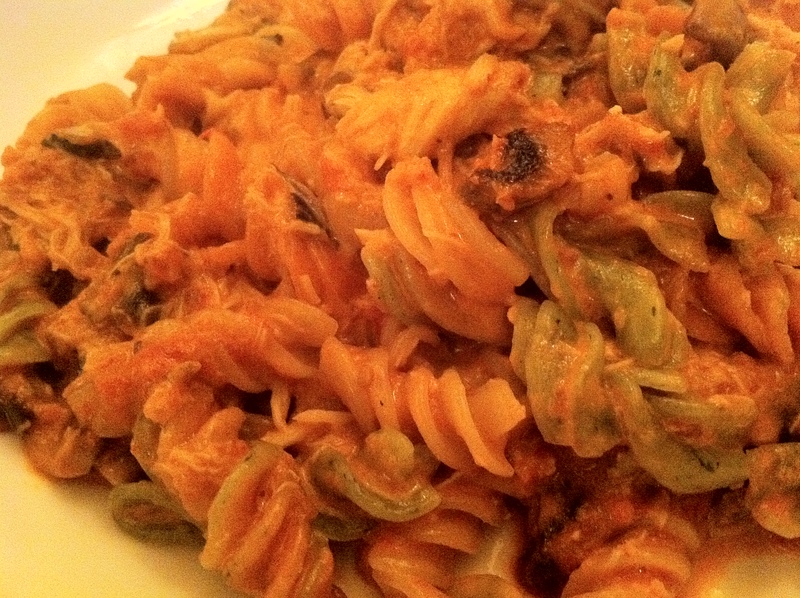 The sauce is a tomato and cream-based sauce with olive oil, all the 3 types of pasta sauces combined! In other words, this dish can be call Jak Pa Lung. Everything also got. Although the dish scored low on appearance, it was delicious. The sweetness of the crabmeat infused into the sauce so thoroughly that you could really taste the scent of ocean. Instead of clashing tastes, the different ingredients blended well together. However, one bad thing is I kept biting into shrapnels of crab shell. I think 14K is very lugi compared to my dish. Dessert: I remember desserts used to cost only $4-5, now only in a few years time, desserts are costing $9-$15. 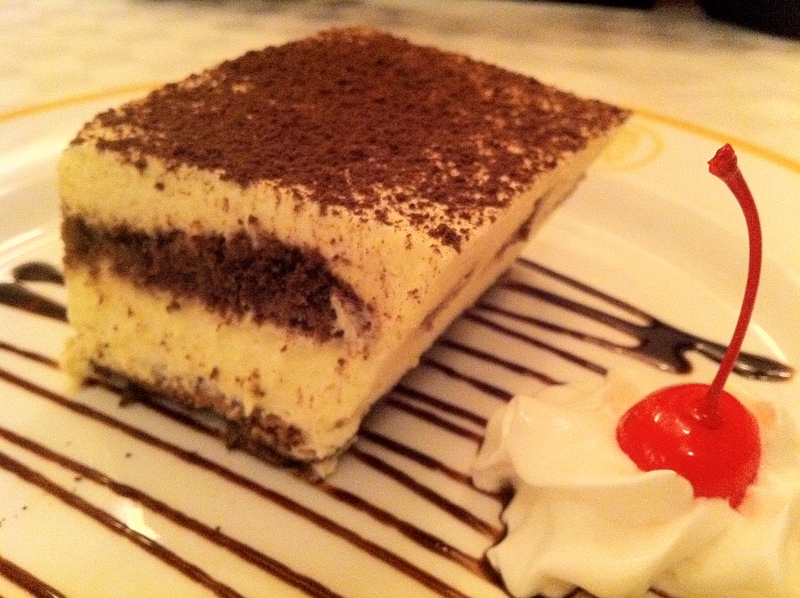 The tiramisu ($9.30) is too expensive.But at least there was layer of sponge between the cream (more effort) compared to the full cream one at Borgata. The cheese here was also fuller and richer, giving it a well-rounded taste. Good ambience, delicious food, what marred the experience is the service. Hard to get the Pinoy waiter’s attention. We asked for water from him – and he forgot. We asked for two or three other things, including a receipt (so I take down the price) but he again forgot to return me the receipt. Too forgetful and careless. When I reflected this to the Indian manager, I whispered it to him very nicely. He kept interrupting saying “yes.. yes.. ok..” in an impatient tone I wondered if he had told the waiter to be more vigilant. On the other hand, the two other waitresses did an excellent job. I am a big fan of your food blog. Unfortunately, it is not very vegetarian-friendly. Could you bring back your Vegetarian Tuesdays please? Also, something I am curious to know: what is the rubric you use to review/grade restaurants? At first, I thought the decimal places in your ratings were a tongue-in-cheek joke. Subsequently, I realised that you probably have several criteria to gauge the quality of the restaurants. Looking forward to hearing your responses! Kam xia leh. Renowned playwright liking my ah beng food blog. Pardon my england hor. You’re right. I haven’t been eating vegetarian. Ok. I’ll start Vegetarian Tuesday this week to save the animals. Any restaurants to recommend? I don’t want those “mock” meat type. I prefer delicious vegetables combination. I also should start a Halal Thursday to be Muslim-friendly too. Racial diversity rocks. I split them into several categories, such as ambience, cleanliness, service, accessibility, amenities, etc, and each category is graded upon 10. Then I reduce the total score to be over 5 stars. Rigorous leh. Don’t pray pray. I remember eating at this place recently and I kept on thinking: I must tell Mr Rochester (are we allowed to use your real name here?) to visit this place. Unfortunately, thought did not translate to deed :S But now that you have pledged to bring Veg Tues back, I will be more conscientious about relaying info to you! Likes the concept of Halal Thursday. You should have themed days, methinks. Anyway, some veg restaurants for starters: Fortune Centre has quite a few veg outlets. Original Sin, http://www.wholeearth.com.sg/ , http://www.naivecompany.com/ , http://www.veganburg.com/. Veg-friendly places: http://www.everestkitchen.com.sg/ , http://www.fatboys.sg/ , http://thegardenslug.com/ , Nakhon Kitchen. Okay, gotta stop. Getting hungry! Anyway when you have time, please do a detailed post that tells everyone what your rubric is. It will make you more credible (there’s a standard to rely on) + distinguish you from other food bloggers (their scoring system seems arbitrary). I woke up this morning, wanting to eat some meat, then I remembered it’s Vegetarian Tuesday! I will drop you a FB message with links to some restaurants. Can’t seem to post it here. Anyway when you have time, please do a detailed post that tells everyone what your rubric is. It will make you more credible (there’s a standard to rely on) + distinguish you from other food bloggers (their scoring system seems arbitrary). your comments went to spam. But next time, just post it, i’ll unspam it. Thanks for your effort!